It went very well, but like many sessions, it seemed too short. We spent about an hour, but it could have easily gone twice as long. 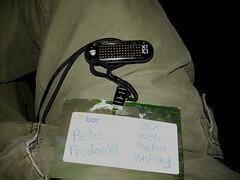 I talked a bit about my PIX Sports device, which is cool, but not quite cool enough. I described how it sort of required morse code to program it to display something, and while the geek factor on that is high, the usability is a bit low. The group was surprised you couldn’t just plug it into a USB port to program it. That would definitely be a nice addition (as long as it didn’t require some lame Windows-only software.) I also mentioned how it had no on/off switch and to turn if off you have to remove the batteries. Someone thought that making it use USB for charging would be a good idea, and it would. So this is a gadget that is cool, but the 2.0 version could be so much cooler. Posted on Thursday, October 5th, 2006 at 2:30 pm. Subscribe to the comments feed. Both comments and pings are currently closed. Post on your own blog.